Does Planning Party Music Depend on Good Luck? Thanks in advance for reading this article. I appreciate your interest and hope you get a few good ideas. I'd love to hear what you liked. Please write me a little COMMENT below. Start a conversation. Tell me what you think, and I'll reply. Promise. Nearly every day, I help people planning party music and wedding music. And then my band creates the perfect music at these celebrations. I’m so lucky to make a living this way! Recently I got lucky a different way. 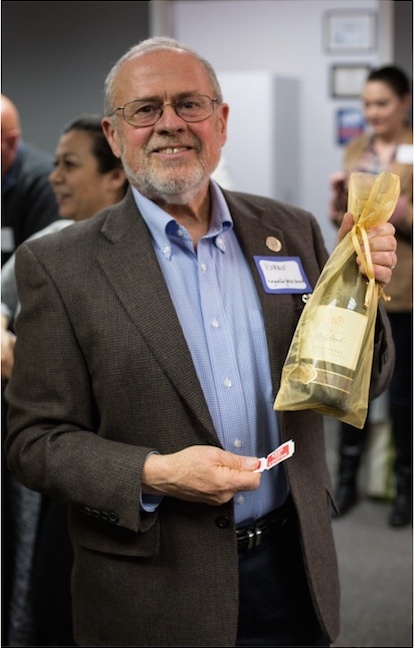 Here I am, winning a bottle of wine at a networking meeting for special event pros. Thanks for this happy photo to my friend Harrell Harris. Dumb luck? Maybe, but I DID buy more raffle tickets than most people there. It’s nice to be lucky with wine, of course, but I’m far happier entertaining people with my music. When our music makes these parties and weddings successful, is it because we’re just lucky? Well, yes. But not entirely. Sure, we have the skills. We have years and years of experience. We’ve learned what it takes to bring these festivities to life. Whether the event’s mood is upbeat, casual, elegant, formal, or anything else, we help everyone there get in the swing of things and have a memorable time. It’s more than just skills. At every event, we create conditions to let lucky breaks happen, and we’re alert to catch them. Often they arrive as roadblocks. So here’s a tip when you’re planning party music or wedding music. Recognize obstacles as opportunities to get lucky. Be bold and apply a creative solution. Buy some more raffle tickets. CLICK here to tweet this post, and join our Magnolia Jazz Band fans on Facebook. You’ll receive daily tips for planning wedding and party music, and you’ll get reminders for our public events. Thanks for reading this article. I appreciate your interest and hope you get a few good ideas here. Got one or two? I'd love to hear what you liked. Please write me a little COMMENT below. Start a conversation -- I'll reply. Promise. By the way, does a friend need help selecting wedding or party music? Do them a favor: EMAIL this article, or SHARE it on Facebook, LinkedIn, or Google+. And if you find my blog useful, please LIKE it, TWEET it, and SUBSCRIBE for more ideas. Use those cute little icons below. Meanwhile, the Magnolia Jazz Band entertains at weddings and parties throughout the San Francisco Bay Area. If you are ever nearby, you’ll love catching us in action, seeing and hearing us create a great mood. How can I help you? Call 408-245-9120 or use Robbie@MagnoliaJazz.com. Planning a celebration? Ask about our availability. the right music can really make or break a party! I think it’s important to know beforehand what most of the guests like as well. heather recently posted..What is a Fodder System? I love music and so I agree it can make or break a event. Congrats on winning the wine. I too love Networking events and raffle but I do not know when to stop buying tickets. Glad you like this post. We agree: music does magic. What kind of networking do you do? Great attitude you have. Music can be magical and it is a skill to put the right pieces together.. Turning obstacles into opportunities is a skill everyone should master Thanks for sharing! Glad you like this post. Optimism takes us far. I enjoyed your story about the April Fish. Do you suppose it might be a red herring? Haha. “Recognize obstacles as opportunities to get lucky. Be bold and apply a creative solution.” – love it! Don’t whine of how this could happen to you but ask how can you make it happen? I was actually planning to say exactly what Delia said! You have a great life quote there Robbie! Next post: Selecting Party Music? Don’t Sabotage Yourself. Want a Reminder for our Public Events? • Robbie, "What's your fee"? • Use Your "Team of Experts"
• How to Delight your Guests. • Why use a Personal Touch? • Got a Last-Minute Party? • Why Prepare So Carefully? • "Forcing" your party music? • Why I Can't "Cut Loose"
• "Just make it perfect, OK"? Selecting Party Music? Don’t Sabotage Yourself.